Things I learned long ago. Get in close, put the viewer in the scene. It's a small frame, use every millimeter, edge to edge. Working with Landesberg Design on an annual report for The Pittsburgh Foundation this was a dance class. It was pretty "free form," which is another way of saying it was crazy. Kids were everywhere doing their thing. I just tried to stay in the middle of it all and key in on a few of the more expressive dancers. Everything came together in this frame, edge to edge. The moment I pressed the shutter, I could feel the gentle hand on my shoulder from my old professor, Joseph Costa. I knew that one would make him proud. When I was just beginning this journey, a mentor told me, photograph the feeling, not the face. I’ve tried to stay true to that advice ever since. On assignment for Mercy Hospital, a social worker and I was visiting the home of a teenage mother. 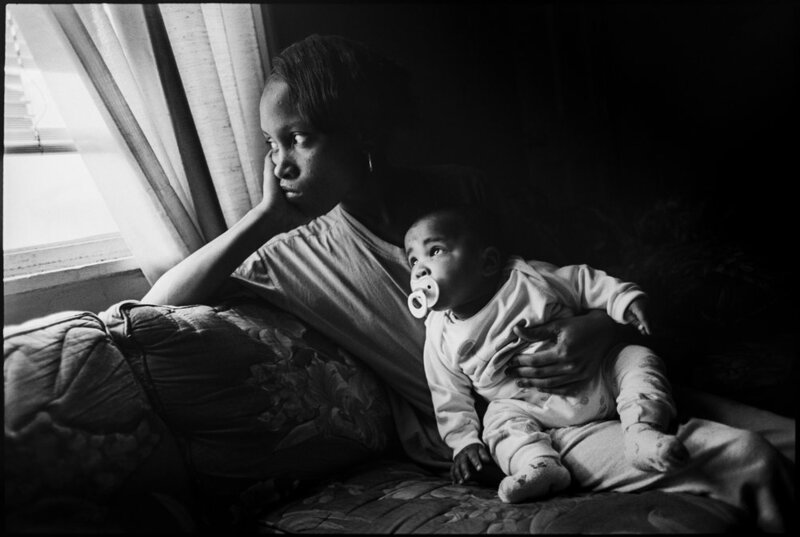 As she sat on the couch with her baby, she glanced out the window at that moment the child looked up at his mother. You can’t script moments like this. All you can do is be ready, and be present. Something like this happens in a blink. Everything comes together at once. One frame and it’s gone. But that one frame has the feeling. In the world of film, I think I’ve shot, and owned, just about every possible modern camera format manufactured. I’ve had 2x3 (35mm); 4x4; 6x6; 6x7; 6x9; 6x12; 6x17; 4x5 and 8x10. I never tried 11x14 or the giant Polaroid, but still, not bad. Of all of the cameras I’ve owned, the one I enjoyed the most is the swing lens Widelux with its 2x6 format. The camera has limited shutter speeds, no focus and is super quirky to use, but once you get into a rhythm, it can be sublime. To produce full-frame images with this camera, with a subject and related information corner to corner, takes a near Zen ability to visualize because when you push the shutter release, the lens travels along a curved track to expose the film. Unlike other cameras being instantaneous, there is a time lag between the left and right sides of the image capture. Visualization is critical. It would be logical to assume, given the peculiar nature of this device, most practitioners would use it for fine art photography. And it’s probably right, at least to some extent, but never underestimate the mind of a photographer. In my time using the Widelux, I produced images for annual reports, portraiture, weddings and documentary projects. The photos here are from one commissioned project – the 1994 opening of the Andy Warhol Museum. I was one of five photographers (two local, three national) hired by the museum to document the weekend activities. It was nearly seventy-two hours of non-stop picture opportunities. Fireworks, street fairs, black tie gala, clowns, celebrities, and of course, everything Andy. I decided to cover the opening, at least partially, with a Widelux because of the grand nature of both event and image produced by the camera. It just seemed to fit. It was also different, much like Andy.